UPDATE: The following post is retained for archive purposes only. Since it was published, far better techniques for retrievable anchors have been developed. In particular, fiddlesticks now make it possible to achieve the same goal — moving through a canyon without leaving anchors behind — while needing half as much rope, avoiding pulling half the rope through an anchor, having less chance of things getting stuck, and without as much additional materials. Read more about the use of fiddlestick retrievable abseiling anchors. Most of the time in canyons you will be using existing anchors. Where they aren’t up to scratch they should be cut off and replaced, which is one of the reasons to always carry a few spare slings. But there are times where you simply don’t want to leave an unsightly sling behind. I have used this setup when entering more remote canyons, particularly in cases when an off-track entry route had us arrive at a cliff edge high above the creek. It can also be of use in more exploratory expeditions where you don’t want to be chewing through a heap of slings or taking away from the pristine environment. 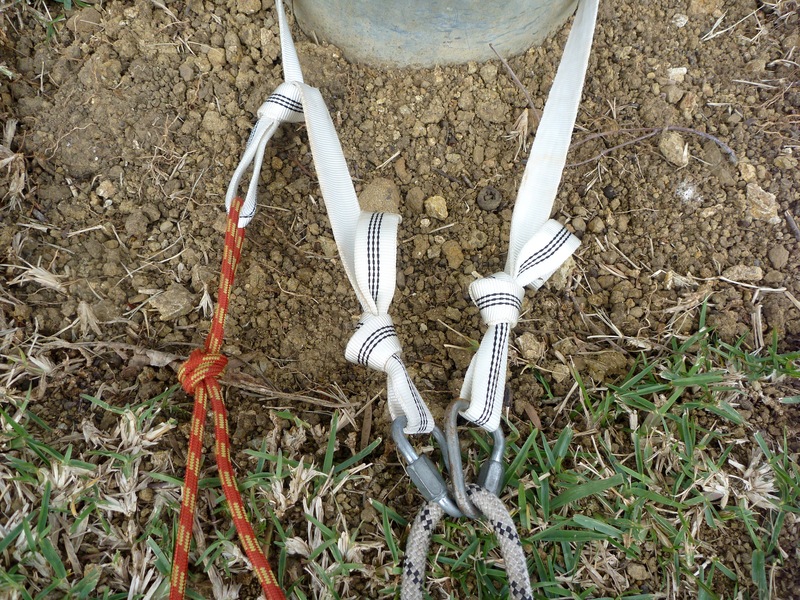 There are a range of ways to create a retrievable anchor, but this technique is particularly good when abseiling on doubled ropes. To make it, simply take about three metres of 25mm tubular tape. Tie a tape knot at each end to create two loops. Close to one of these ends tie another loop into the sling. For the smoothest operation, place a maillon on both ends. To use, simply place the tape sling around your anchor, run your abseiling rope through both maillons and throw your rope down as normal. Tie one end of another rope to the extra loop in the sling (this rope doesn’t take any load, so feel free to use a thinner hand-line or pull cord). Once everyone is down, pull down your abseiling rope as normal. Once it comes through the anchor the loop is broken, allowing you to pull the remaining single rope and have the whole rig come down. Be aware that the extra knots and maillons mean that there are more items that can get stuck in cracks, so be careful when and where you use it. If there is a high chance of it getting stuck, just bite the bullet and sacrifice a sling.